South Dakota Sen. John Thune was elected to serve as the Republican Majority Whip Wednesday. 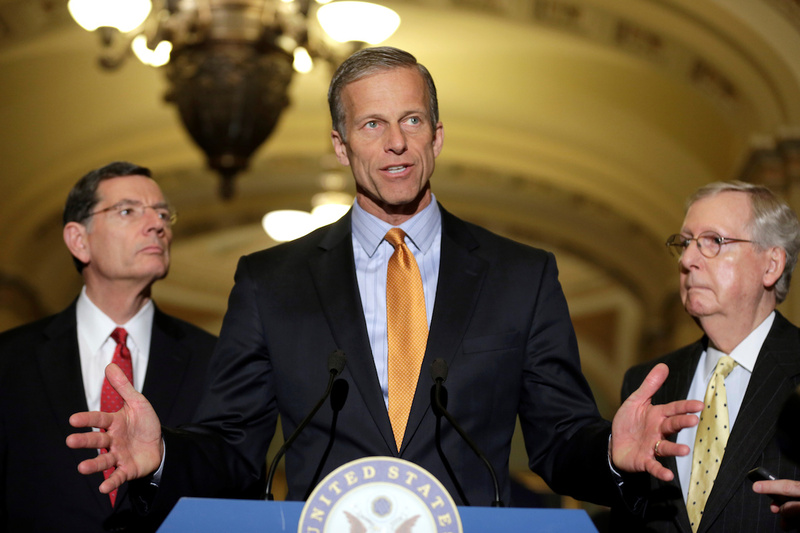 Thune was nominated by former whip, Texas Sen. John Cornyn. This comes as Cornyn met his three-term limit in the position. The majority whip is the second-ranking position in Senate leadership. Republicans voted for other leadership positions Wednesday, making Missouri Republican Sen. Roy Blunt the Policy Committee chairman, Iowa Republican Sen. Joni Ernst was voted in as vice chairwoman of the GOP conference and Wyoming Republican Sen. John Barrasso will serve as Senate Republican Conference chairman, according to The Hill. Thune has served as chairman of the Commerce, Science and Transportation Committee since 2015. He will now have to step down as chairman, after taking his new job as majority whip. Senate Majority Leader Mitch McConnell praised Cornyn Wednesday, giving him a Louisville slugger baseball bat with “To John Cornyn – The Best Whip Ever,” written on it. Sen. Joni Ernst (R-Iowa) has been elected to serve as vice chairwoman of the Senate Republican Conference, becoming the first woman to be elected to a Senate GOP leadership position since 2010. She defeated Sen. Deb Fischer (R-Neb.) in the only contested Senate Republican leadership race after months of quiet campaigning in the conference. McConnell was reelected as Senate majority leader, Sen. John Thune (R-S.D.) was elected as majority whip, Sen. John Barrasso (R-Wyo.) was elected as Senate Republican Conference chairman and Sen. Roy Blunt (R-Mo.) was elected as Senate Republican Policy Committee chairman. A woman has not served as a member of the elected Senate GOP leadership since 2010, when Sen. Lisa Murkowski (R-Alaska) stepped down as vice chairwoman of the GOP conference after losing her primary race to conservative challenger Joe Miller. Fischer and Sen. Shelley Moore Capito (R-W.Va.) already serve as informal counselors on McConnell’s leadership team. Senate Republicans also came under scrutiny during Brett Kavanaugh’s Supreme Court confirmation hearings over the all-male GOP membership of the Judiciary Committee.